The Drew Science Magnet School 90 reconstruction was part of the $1.4 billion Buffalo Public Schools Reconstruction Program aimed at modernizing the city school system. 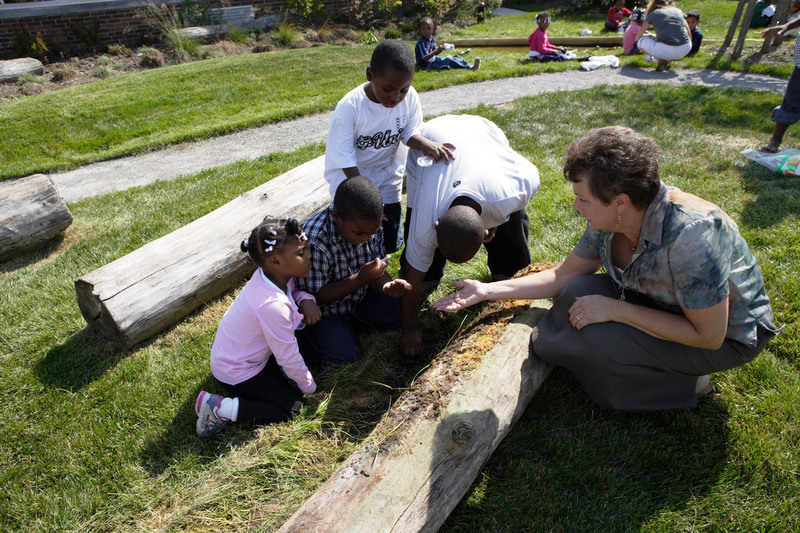 The idea of creating an outdoor classroom, particularly one in an area of the country that is regularly cold and wet, and in a community that faces significant economic challenges was one that had to be championed. Fortunately for the children that attend the Drew Science Magnet School they had several champions. As advocates for children and their access to nature, we were excited with the possibilities for this project and after the first meeting with the faculty leaders and school Principal we knew this project would be special. 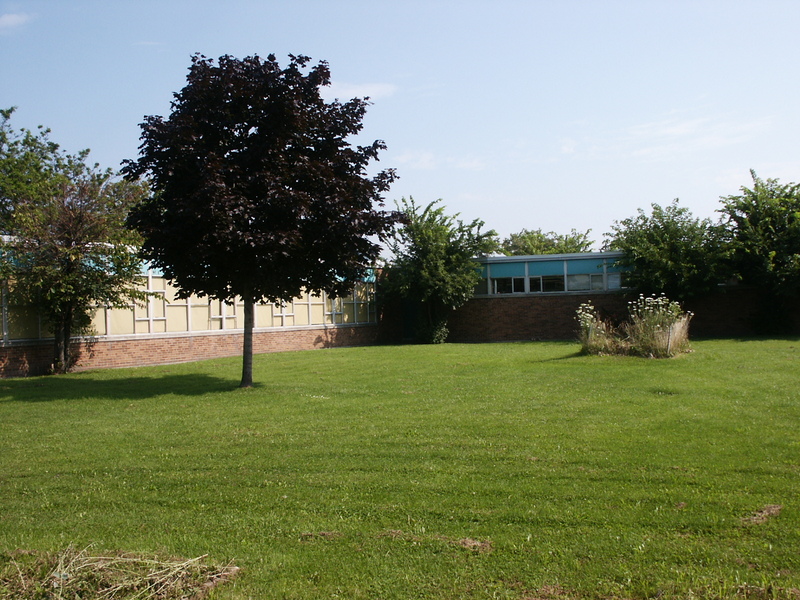 As part of the Buffalo Public School’s Joint Reconstruction Project, School 90 received a $9 million dollar renovation which was to include an outdoor nature based science area for students. Through various user group meetings we heard a repeating concern from faculty throughout the building, that finding time to get the kids outside was a struggle because of the course work required throughout the day and school year. 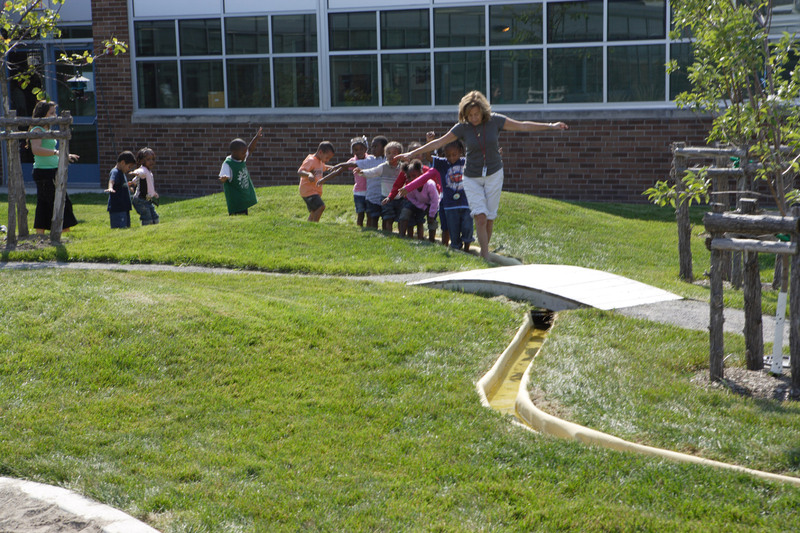 Classroom teachers often thought about going outside as part of recess, or as a special occasion, but the science teachers saw the opportunities for lessons to occur outside. We had a large area to work with and began playing with the idea of what a space would need to have in order to meet the student’s daily NY curriculum needs for early childhood education. In addition to math and science, could we also teach art, music, language arts, and even regional history outside? And what elements would we need to design into the landscape that would support daily lesson plans? 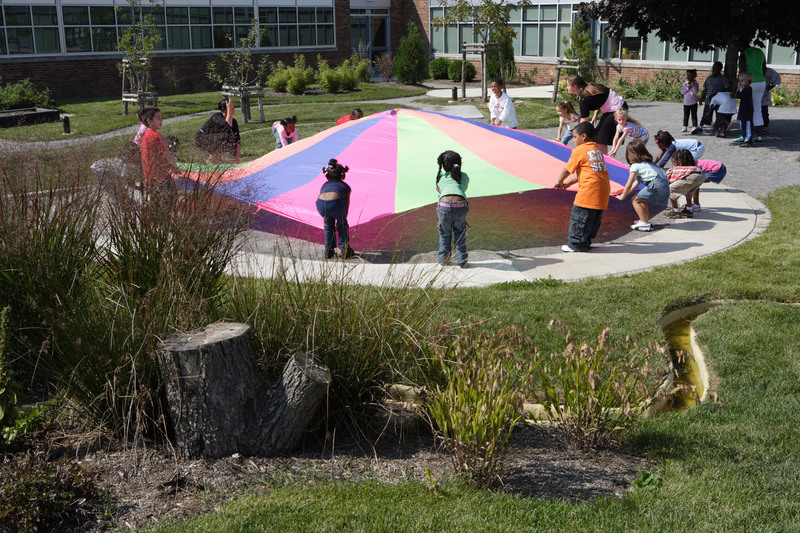 Could we create a space where every lesson could be taught outside, every day? Could we create a class room with clouds for a ceiling? Our award winning design created six overlapping classrooms, together with a faculty initiative to create unique “lessons in a back-pack” ensures there are few reasons to decide between spending time outside and meeting curriculum requirements. 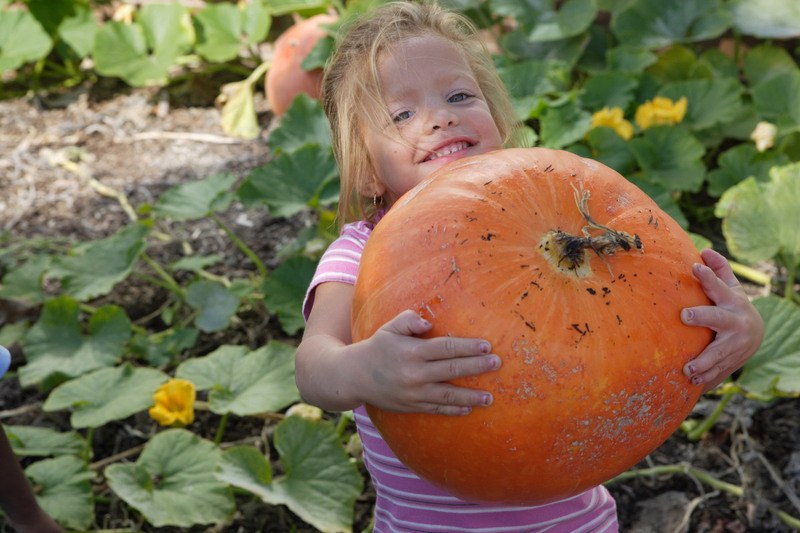 A stream, rolling hills, vegetable gardens, sand boxes and a giant gathering circle provide engaging opportunities for counting, observing insects, reading and naming but also for climbing, balancing and even an old fashioned game of tag. Despite the neighborhood’s struggles with poverty and crime, School 90’s courtyard offers access to such a safe and clean green space. 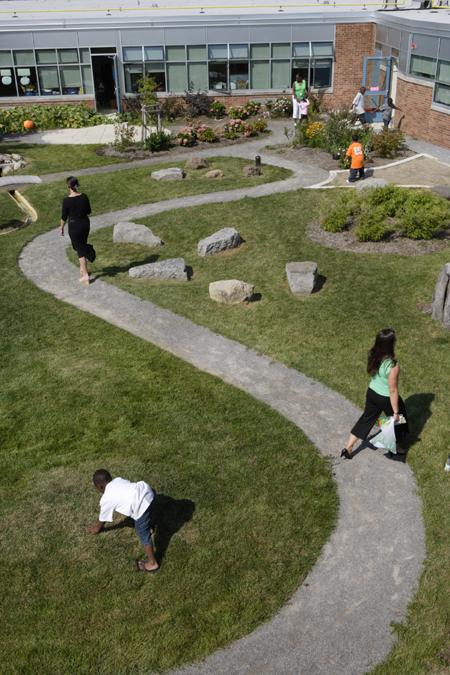 This unique garden is a space where children learn through touch and exploration, a space where they can build social skills and also find comfort and relaxation through the natural environment around them. We worked extensively with the faculty and school administrators to determine the type of content needed to meet curriculum requirements throughout the design process. At the completion of the project the School faculty were able to solidified relationships with the nationally recognized Roger Tory Peterson Institute and the University at Buffalo’s education department to use the courtyard as a tool to teach teachers how to create curriculum specific to outdoor environments. 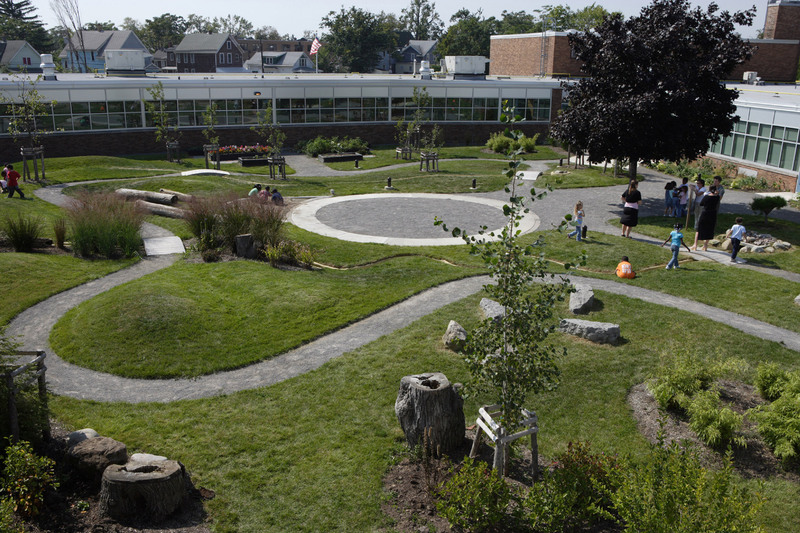 The area of the courtyard designed to meet science curriculum contains a variety of native plants, an area of the water channel that widens to create a bog where students can place and study water plants and logs which students can roll to study insects living underneath. There is also a rain barrel and rain gauges to monitor and learn about rain fall. The mounds can be used for placing boards between and rolling balls to learn about gravity and simple mechanics. The pavers next to the raised planter boxes are in varying materials that can used to test how they warm/cool and dry from the sun. 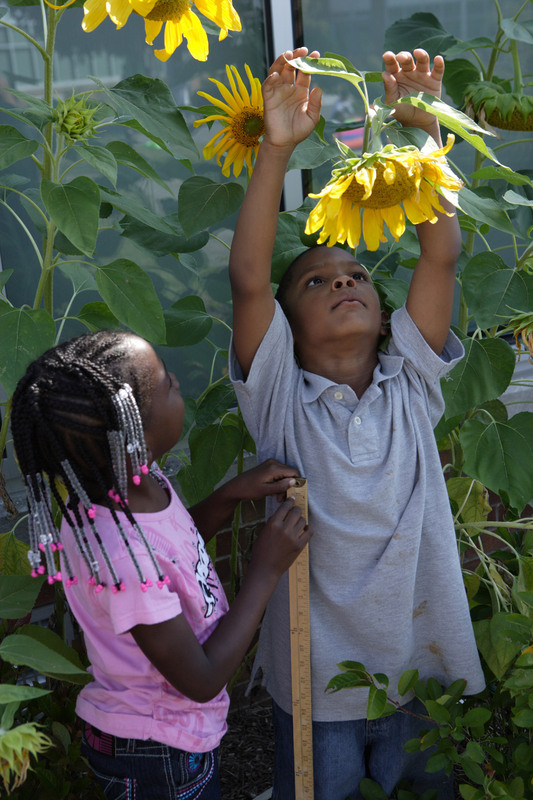 The area of the courtyard designed to meet math curriculum includes planter boxes where students can count seeds, plant flowers and vegetables as well as measure and document their growth. The area also includes pavers of varying proportional sizes that can be used by students to count and measure how many 4″ x 4″ squares make up a 12″ x 12″ paver. Each oval concrete pad in the courtyard also includes a New York State trigonometry question. These larger mathematical concepts introduce relationship of shapes and using the body to understand spatial relationships. The area of the courtyard designated for art has a variety of plants chosen to inspire creativity. The shrubs selected will turn brilliant fall colors of red, orange and yellow, or to provide berries to make ink. The perennial plants and flowers are all intended to be used for picking and testing to see if any petals can be used to color. A nearby chalk board can be used to draw on. There is an oval area of concrete that can be used to set up art easels allowing the students to “paint like Monet” in the garden. The area of the courtyard designated for music classes has plants and shrubs that will attract birds and insects that sing. In addition several plants have seed pods that can be picked and dried to make musical shakers, and grasses with seed heads will make noise in the wind. The water feature and water bubbler also create sounds for students to listen to. There is an oval area of concrete where students can gather, set up chairs and music stands to make music with the birds, or to even hold outdoor performances. The area of the courtyard designed to meet curriculum for geology consists of regionally found rock types so students can learn about the types of rocks that make up their area. This also overlaps with lessons about the area’s geography and history. This area also contains native plants with ethno-botanical uses allowing students to learn about how local Native Americans used plants to make rope and dyes or to perform household tasks. The area of the courtyard designated for language arts is directly outside of the media/library room. The renovation of the library included a large bank of windows to over look the courtyard. The language arts area includes a bamboo tee-pee and boulders placed in rings that can be used for sitting and story telling. A chalkboard can be used by each class to “report” their observations to others. Signage was purposely not designed in order to allow each successive class to “name” elements over and over again. 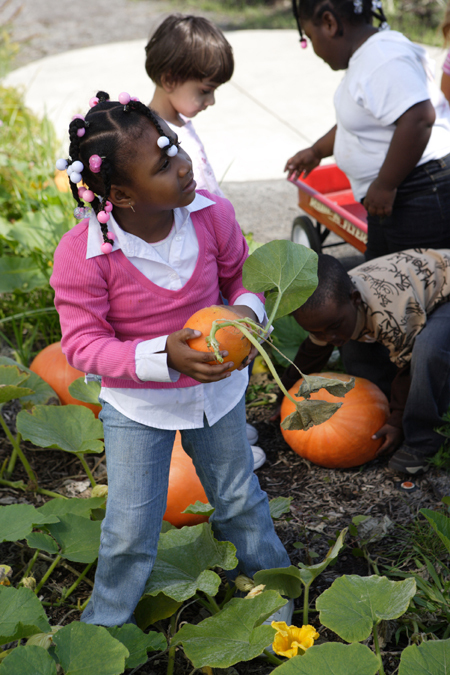 Physical activity and getting students outside to play has become an important aspect in today’s world. The courtyard is intended to stimulate and encourage students to run, jump and climb. The logs and mounds help to develop children’s motor skills and balance. The entire courtyard has paths and bridges that are accessible allowing students to navigate all areas of the courtyard without assistance. The main circle walk can be used for play activities, running laps or riding tri-cycles.